Perfectly formed for patio fragrance. 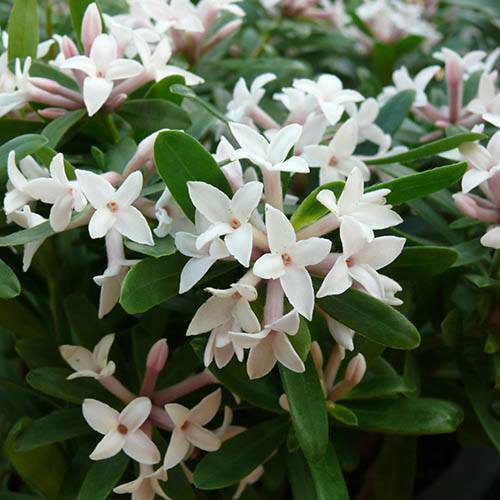 It's a semi-evergreen variety which produces flowers on new growth, meaning the creamy white blooms just keep on coming all summer long! Eternal Fragrance's blooms are perfumed beautifully so is an ideal plant for displaying around entrances, pathways and entertaining areas where you can really enjoy the scent. What could be better than the sweet heady fragrance of Daphne in the garden! Eternal Fragrances perfumed blooms are produced in abundance from April until October every year. It's a compact and slow growing variety so it is perfect for smaller gardens and this semi-evergreen Daphne produces flowers on new growth, meaning the creamy white blooms just keep on coming right through the summer! If your soil is heavy add plenty of well-rotted manure or compost to the area and dig it in well. Horticultural sand/grit added to the mix is also beneficial.